NYE Snacks! | Eat More Plants. The last few hours of 2012 may be very cold but at least they’ll be full of tasty treats and love. I absolutely love these gilfeather turnips that I get from a farm stand about 15 minutes west of my house. 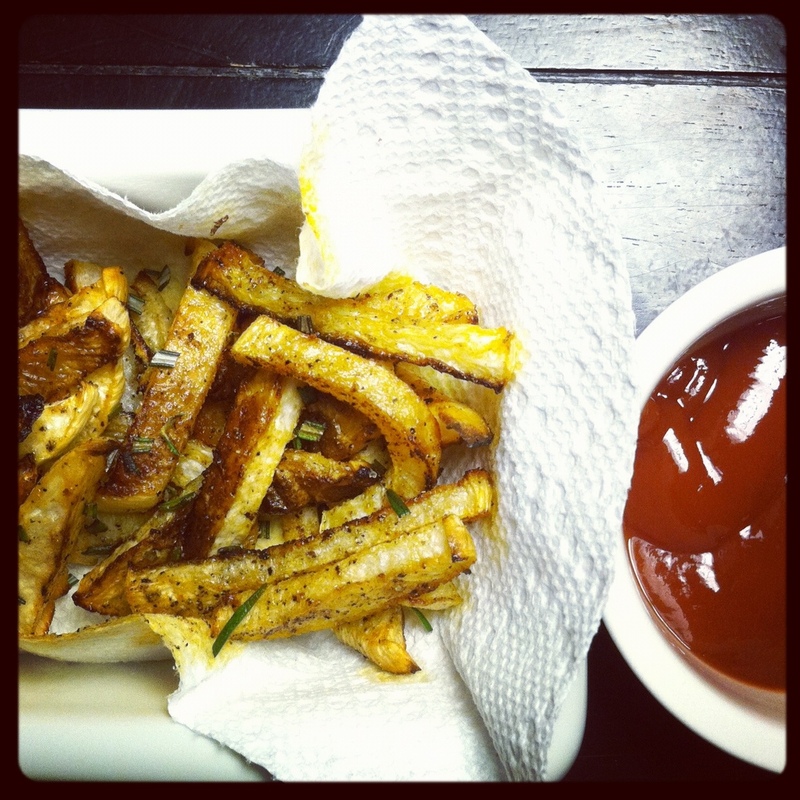 This is my favorite way to make them: faux fries! They’re huge too. I can make about 4 cups of fries with one turnip. I don’t feel guilty after eating them because they’re not super greasy but they still give you satisfaction of eating some salty, smoky goodness. I cut these into even fry shapes and tossed them with olive oil, liberally. Sprinkle with salt before AND after baking. Also sprinkle with smoked paprika before going in the oven. Give them a toss after 15-20 minutes of baking at 375 degrees, just so they brown evenly. After taking them out of the oven, toss them gently with some fresh minced rosemary. Yum! The fresher, the better! Root veggies tend to get mushy if they’ve been sitting on a store shelf for a while. The faster they can get to your table from the garden, the more crispy they’ll stay when cooking.